IM A TEEN MOM OF TWO. I HAVE MY OWN PLACE, I HAVE A FULL TI - ProudMummy.com the Web's Community for Mums. I'M A TEEN MOM OF TWO. 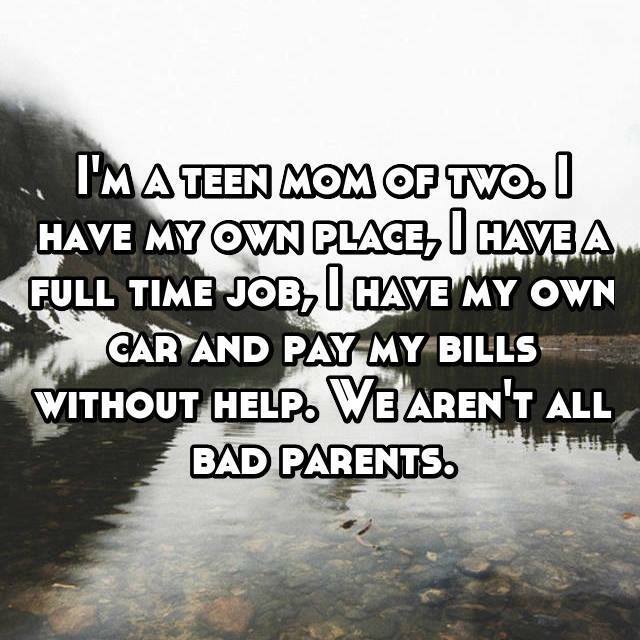 I HAVE MY OWN PLACE, I HAVE A FULL TIME JOB, I HAVE MY OWN CAR AND PAY MY BILLS WITHOUT HELP. WE AREN'T ALL BAD PARENTS. Hang on so your automatically a bad parent if life has made it hard to get your own place pay bills rtc because of age. The above also doesn't automatically make you a good parent either there's a lot more to it then that. Just saying.